It’s an unavoidable fact: inventors sometimes create devices that kill. Someone, somewhere, sits down to design weapons, ammunition and bombs. Other inventors have also met the demand for efficient, government-approved machines that put death sentences into effect. The first electrocution using an electric chair was in 1890. The condemned man was William Kemmler and the location was Auburn Prison, New York. The execution wasn’t an immediate success and took a total of eight minutes. The electric chair came about because New York State wanted a death-dealing device that was more humane than hanging. A dentist, Alfred P. Southwick, suggested using electricity. Southwick had seen how electricity had instantly killed a drunk who had touched a power line. He therefore concluded that strapping someone into a chair similar to that of a dentist’s, and passing electricity through the condemned person, would lead to immediate death. New York State commissioned two electrical engineers, Arthur Kennelly and Harold P. Brown, to create the chair. Both worked for the inventor Thomas Edison. They developed and promoted alternating current (AC) rather than direct current (DC) as the best means of execution. To prove this, Edison and his two engineers demonstrated how AC was able to kill animals. In 1889, New York State agreed to replace hanging with the electric chair. Despite the failure of the electricity to kill William Kemmler instantly, other American States soon adopted the chair. Some American States still have electric chairs available as an option for capital punishment. Nazi Germany used gas chambers to kill millions of people during the Second World War. These deaths formed part of a genocide programme rather than specific capital punishment. There is also some evidence that Napoleon Bonaparte created gas chambers in areas such as the holds of ships. His men introduced sulphur dioxide into the enclosed spaces. In this way, the allegation is that Napoleon killed thousands of rebellious slaves in Guadeloupe and Haiti. It has therefore been common knowledge for many years that poison gas released in a confined space can kill people. As a consequence, the authorities at Nevada State Prison in America used lethal gas as a method of capital punishment in 1924. They pumped the gas into the cell of a murderer, Gee Jon. This first attempt to use gas as a means of execution failed. Nonetheless, some American prisons created gas chambers. Typically, the gas was hydrogen cyanide. Executions in gas chambers continued in America until 1999. Some States, however, still have gas chambers as an option for use in death sentences. The National Assembly of the French Revolution introduced the guillotine. 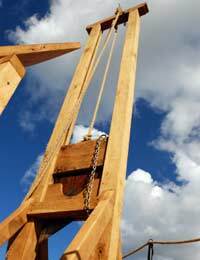 The Assembly favoured the guillotine over other proposed methods of execution because it killed people instantly by decapitation and did not cause undue pain. Before deciding on the guillotine, the Assembly formed a committee to look into ways of execution. Joseph-Ignace Guillotin was a professor of anatomy who sat on this committee. But Joseph-Ignace Guillotin was not entirely responsible for the invention of the guillotine. The committee took into account various machines from around Europe that beheaded their victims. It was a German musical instrument maker and engineer, Tobias Schmidt, for instance, who designed the angled blade of the device. The first public use of the guillotine for capital punishment took place in 1792. The criminal who lost his life was Nicolas Jacques Pelletier.